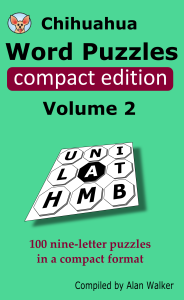 100 quick Chihuahua nine-letter puzzles in a compact format. Light and slender, but bursting with word puzzle goodness! See how many words of at least four letters you can make from an array of nine letters. The letter in the middle must be used in every word, and at least one word can be made that uses all the letters. 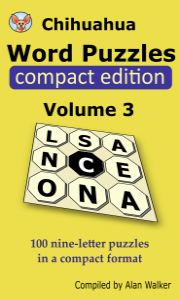 Each book contains 100 puzzles. 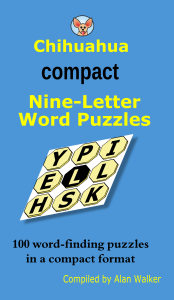 All possible words are listed in the Solution section. Available from Amazon, Amazon UK and other online booksellers. Amazon — UK, US. Or search at your favourite online bookseller. Chihuahua Puzzle website and software © Alan Walker 2005-2018. Direct all enquiries to info@lexigame.com.